Ideally located in the quite Bon Accord area, within walking distance from two of Tobago’s best beaches, Pigeon Point and Store Bay. Close to all the comforts that a visitor needs, restaurants, banks, green grocer and supermarkets. Night entertainments are also accessible on foot. Crown Point International airport is 5 min. drive away. These two villas face each other and are surrounded by a well kept garden. Both have their own private pool. 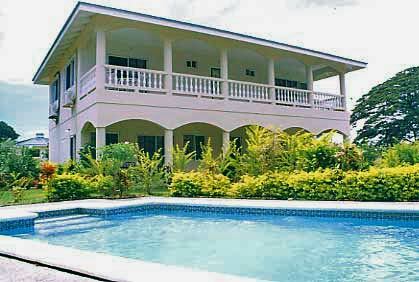 Each villa has 5 bedrooms, 3 with double beds and 2 with single beds (max occupancy 10 persons). All bedrooms are air conditioned and have en suite bathrooms with tubs, WC, hot and cold water. The villas are built on 2 floors, the upper level has 4 Bedrooms, 2 of them open on to a patio overlooking the pool in the front gardens. The ground floor has 1 bedroom plus the living area and a full kitchen equipped with all modern appliances including a dishwasher. The laundry area has washer and dryer. Living-Dining area with cable TV and telephone, the dining area seats 8 persons. Included: personal housekeeper, gardener and pool attendant. All linens are supplied. Scuba diving, snorkelling, glass-bottom boat tours, bird watching, mountain biking tours, off-road jeep safari.